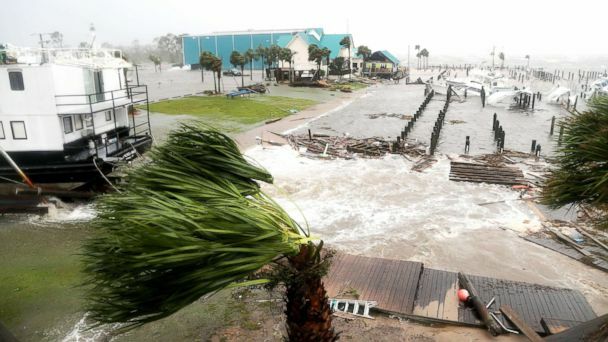 Hurricane Michael ripped through the Florida Panhandle as the strongest storm to come ashore in the U.S. since 1969. The powerful storm then barreled through Georgia and hit the Carolinas. Up to 9 inches of rain was possible in North Carolina and Virginia, along with life-threatening flash floods. The storm killed at least one person in Florida and another, an 11-year-old girl, in Georgia. Michael made landfall Wednesday afternoon in the Florida Panhandle near Mexico Beach and Panama City. As Michael approached the Florida coast, its pressure dropped to about 919 millibars (mb). The lower the pressure, the more intense the storm. Hurricane Katrina in 2005 made landfall with a pressure of 920 millibars. Michael made landfall as a Category 4 with whopping 155 mph winds. A hurricane reaching 157 mph is in the highest category, a Category 5. Michael has now weakened to a tropical storm and is moving quickly north. The storm was near Charlotte on Thursday morning. Tropical storm warnings were in effect from Georgia to North Carolina, including Savannah, Raleigh, Wilmington and Charleston. Up to 9 inches of rain could drench Virginia and North Carolina. Tornadoes are also possible Thursday in North Carolina and Virginia. But it's not just the South in the storm's path. Thursday afternoon a cold front will push east combining its heavy rain with Michael's moisture, threatening flash flooding from Washington, D.C., to New York City to Boston. Flood watches are in effect from Georgia to Vermont.